1969 was quite a year. It was the year that man first walked on the moon, Richard Nixon was inaugurated as the 37th President, and the popular children’s show Sesame Street made its television debut. Horsepower wars among the Big Three were at their zenith. 1969 was also the year that Chevrolet produced the final Impala SS. After a legendary nine year model run, Chevrolet retired the car that gave birth to the SS moniker. Budget muscle like the Pontiac GTO Judge, Plymouth Road Runner, and Ford Fairlane Cobra were gaining in popularity and robbing sales from full-size muscle cars like the Impala SS. But with big block power, courtesy of the big block 427, it definitely went out on a high note and not a wimper. 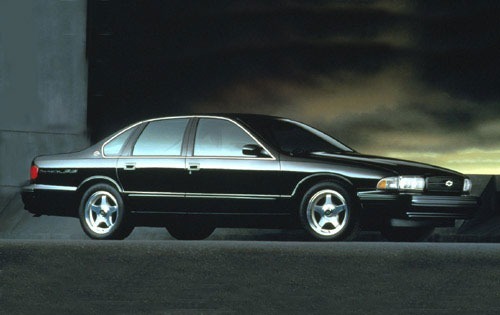 In this edition of Muscle Car Milestones, we’ll take a look at the 1994–1996 Chevrolet Impala SS. 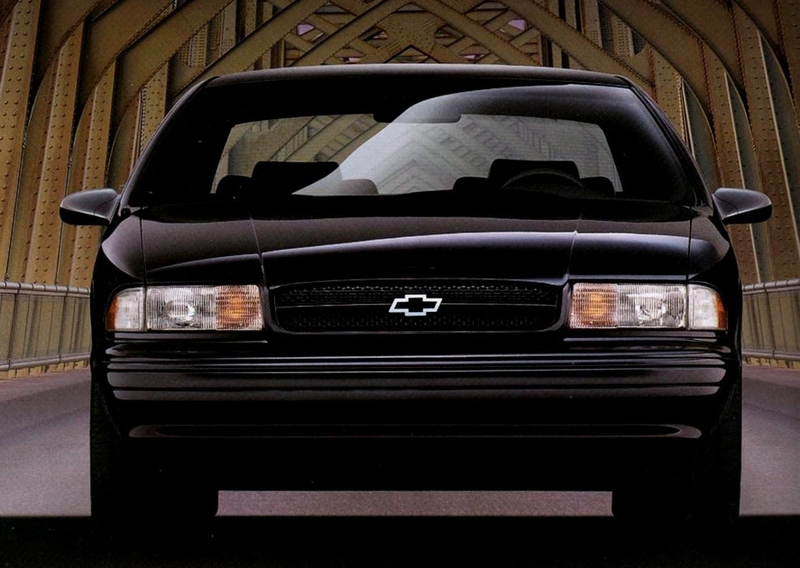 When Chevrolet brought back the Impala SS after a quarter century, it may have gained two additional doors but it lost little else in curb appeal. History was repeating itself in 1994. Just like 1961, we had a young president in the White House and the Impala was the lone SS in Chevy’s lineup. It was an exciting time and the Impala SS brought the full-size muscle car back to the generation that grew up with the original. 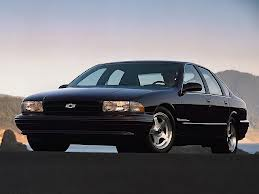 Chevrolet introduced the Impala SS concept in 1993 at the Detroit Auto Show. The car was dressed up in black paint, flashy wheels, and featured a 300 horsepower LT1 engine. The concept was the brainchild of Jon Moss, the manager of General Motors’ Specialty Vehicle Group. The car was such a hit that it went into production for the 1994 model year. It helped spawn the muscle car sedan movement that later brought back other legendary nameplates like the Mercury Marauder and Dodge Charger. This new iteration of the Impala SS had some pretty big shoes to fill. Its predecessors came equipped with big block horsepower, handsome styling, and plenty of goodies a classy muscle car should include. This time around, the Impala’s big block powerplant was MIA. 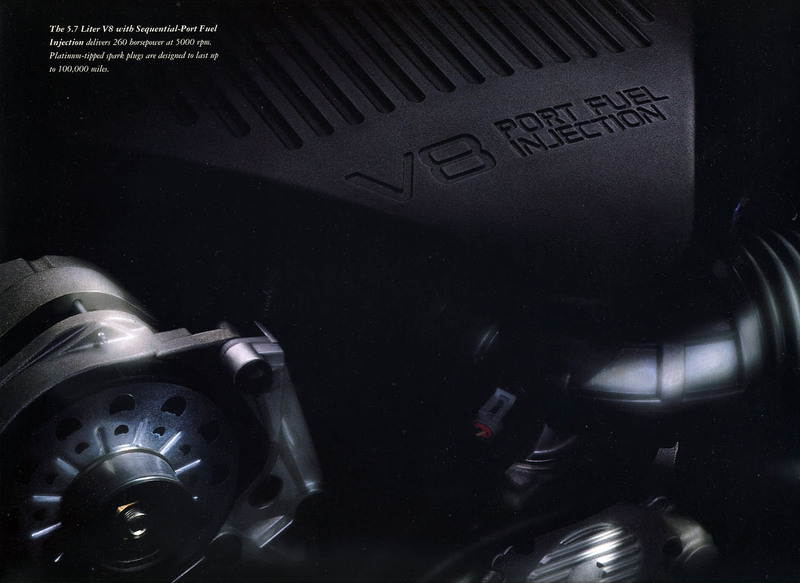 It was replaced by a 260 horsepower LT1 V8 with sequential-port fuel injection coupled to a 4L60-E four-speed automatic. Torque was rated at 330 foot pounds at 3,200 rpm. Purists screamed for a manual transmission option. It didn’t happen. Not to worry, this 4,200 pound cruiser can still run with the big dogs. Car and Driver flogged the Impala SS for their June 1994 issue and got a 0-60 time of 6.5 seconds and quarter mile time of 15 seconds running 92 miles per hour. Not too shabby for a 4,200 pound car. If you think that’s impressive, check this out. The Impala SS is almost half a second faster from 0-60 than the BMW 540i and also slightly quicker in the quarter mile. It’s also worth mentioning that, when new, the SS cost half as much as the Beemer. Also, when compared to the 1961 Impala SS, the 1994 model is half a second faster from 0-60 and can distance the quarter mile equally as fast. No wonder this car moved off the sales floor as quickly as it moved down the highway. 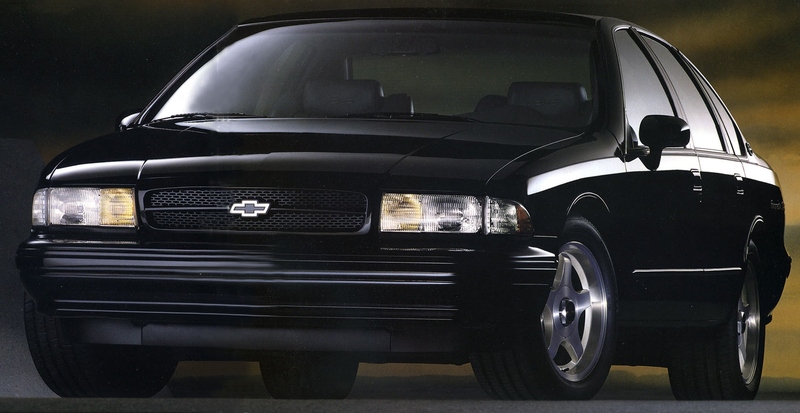 When introduced in 1994, the Impala SS came in any color you wanted as long as it was black. Saying the SS wore enough black paint to make Johnny Cash proud is an understatement. Looking somewhat like a modern day Batmobile, the monochromatic exterior was devoid of flashy trim and chrome. Even the grille, taillight surrounds, and rocker panels were decked out in black. For the 1995 and 1996 model years, Dark Cherry Metallic and Dark Green-Gray Metallic were added to the color palette. Inside, the Impala SS features deeply contoured front bucket seats, leather wrapped steering wheel, and full instrumentation. Amenities such as power windows and seats, tilt-wheel, and AM/FM cassette round out the goodies included with this performance sedan. 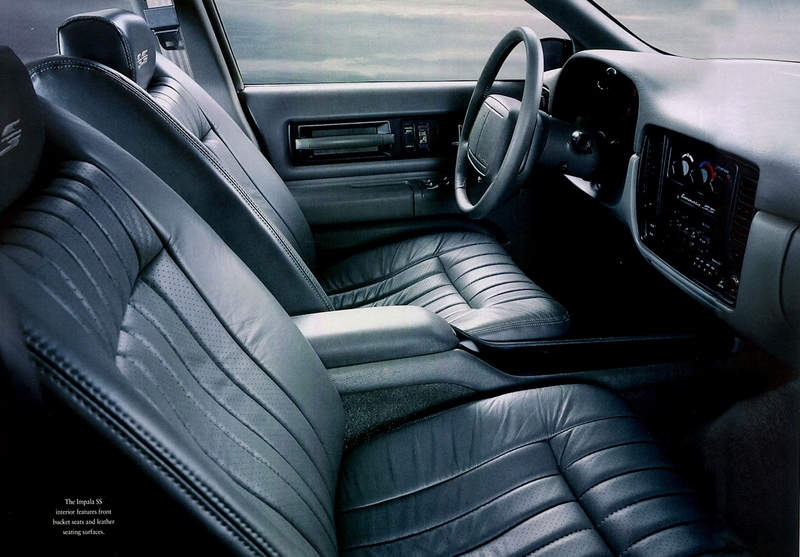 In 1996, the column shifter was ditched in favor of a floor shifter and a new analog instrument cluster featuring a 160-mph speedometer and tachometer replaced the digital unit. It goes without saying that the great looks and features mean nothing if the car can’t perform. Chevrolet gave the Impala SS an arsenal of equipment designed to help the car hug the road. Specially-tuned De Carbon shocks and coil springs on each wheel along with the special Ride and Handling Suspension help keep the car firmly planted on those winding country backroads. Quick-ratio power steering and a limited slip differential keep the driver in control when road conditions turn nasty. Large-diameter disc brakes and a four-wheel anti-lock braking system bring the SS to a halt when the ride is over. Just like its predecessors, the SS is a car that has plenty of road manners, but when provoked, can get down to business. One thing is for sure. 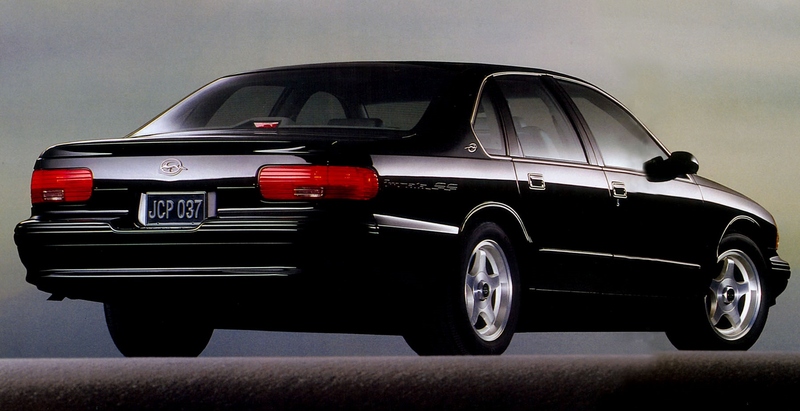 The 1994-1996 Impala SS is a car that has retained its value over the years. A quick scan of listings on the web reveals prices close to sticker and above for low mileage examples. If you’re willing to settle for a car with a few nicks and scratches as well as some miles racked up on the odometer, you can get one for around $10,000. That price is fairly reasonable for a V8 performance car. After a successful three year run, General Motors pulled the plug on the Impala SS and the entire B-body line on December 13, 1996. The plant that produced the SS was needed for SUV and truck assembly. M.G. Randall, a Chevy collector from Michigan, bought the last SS and drove it off the line that day. It would take 18 years for Chevrolet to create another rear-wheel drive performance sedan. Simply called the SS, this performance sedan is a worthy successor to the SS name and reputation.